New Mexico’s state nickname is “The Land of Enchantment”, and the team at Devin Giron, DDS wants to give our patients the brightest, healthiest smiles they’ve ever had to look every bit as enchanting as our beautiful state. Time after time, studies and surveys show that the chief dental concern of most adults is how white their teeth are and how their smile appears to others. We hate to see anyone hiding their teeth when they laugh or smile—smiles were meant to be shared, after all! Whitening is one of our most popular services. There are many over-the-counter whitening options available in stores, but there is no substitute for the reliability, strength, and staying power of professional methods offered by Dr. Giron. Whether you have an important life event coming up (wedding, graduation, class reunion) or you just want to treat yourself, whitening is a quick, easy way to lift your spirits. Whitening your teeth can improve your oral health! Removing stains from your teeth can build their strength, which also makes your whole mouth healthier. Devin Giron, DDS offers both in-office and take-home whitening options for your convenience. Studies and surveys also show that having whiter teeth is a factor in making a positive impression on people in many different situations—whether on a date, at a job interview, giving a speech, or any other public function or large gathering. Bonding is one of the most affordable cosmetic dental options available. Dr. Giron begins by color-matching bonding resin to the shade of your natural teeth. 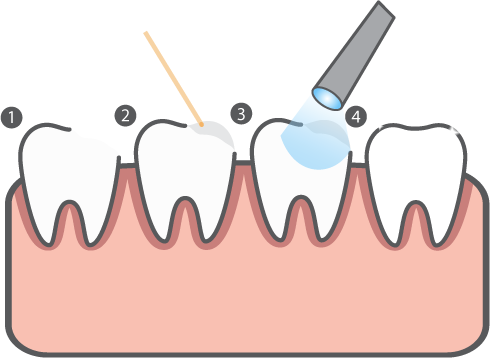 To prepare the tooth, he roughens its surface, then applies liquid that helps the bonding resin adhere to the tooth. Dr. Giron then spreads the resin onto the tooth, trimming and shaping it both before it has been hardened by an ultraviolet laser or light. Once the bonding material has hardened, he shapes and polishes it to match your other teeth. Bonding can close gaps or repair damage in teeth to make them appear more uniform and aesthetically pleasing. Occasionally, bonding is used as a cosmetic alternative to a metal amalgam filling. Bonding can sometimes be completed in one office visit depending on how many teeth are being bonded. Bonding can last up to ten years, so our team will advise you on the best practices to care for your teeth after treatment. How Bright Can Your Smiles Get? You’ll have teeth so white, they’ll have to wear shades! Come see us today. Veneers are thin porcelain shells, custom-made to fit over and remain affixed to the teeth with special cement. The result? A naturally attractive, bright, and symmetrical smile. Veneers are a permanent cosmetic restoration, so the cost will be significantly higher than whitening or bonding. Dr. Giron removes a small portion of the tooth surface for placement of each veneer. Veneers can and should be cleaned like your natural teeth, with daily brushing and flossing. Veneers can repair chips, stains, misalignment and other imperfections and damage to the teeth, resulting in a durable, pleasant-looking smile. Veneers are difficult to stain, which makes them a popular cosmetic solution. However, it is still important to keep your twice-yearly hygiene appointments with us to keep your veneers at their best. Ready for your confidence level to go through the roof? Get in touch now!